The ability to protect your files by depleting and storing them across multiple storage sites, results in a highly flexible and secure way of protecting your most important information. Aside from the site clues on your clue card, the location of your Panwrypter storage sites is not documented on your Mac, or any other form of electronic storage. This protects your files against electronic theft from cybercriminals, and means that only you can access them in the future, since you are the only one who knows where the storage sites are. With this in mind however, over time the risk of forgetting the locations of your storage sites becomes greater. Even if you can remember where your sites are, the time taken to recall their details might be inconvenient. Clue Cards provide a convenient and secure way to help you recall the details of your protected session a later time. They document the session name, along with site clues about the locations of your storage sites, using a QR Code that can be printed and stored separately from your storage sites, for example in your filing cabinet or safe. To create a Clue Card for your protected files, simply provide some alternative text (i.e. a clue) for each storage site. This tells Panwrypter to generate a Clue Card during the file protection process. The Site Clue you provide should ideally be explicit enough to help you remember the site location, while being vague enough to prevent others from doing so. As long as you have provided site clues, a Clue Card will be created and placed in the root of your protected session. From here, simply select the Clue Card button in the lower right of the screen to open your Clue Card in Preview. If you need to print the Clue Card at a later time, you can use the "View/Print Clue Card" option available on the "Restore Screen"
In Preview, select File-Print to print the Clue Card. At a later time when you need to collect and restore your protected files, you can scan your Clue Card from the "Collect Screen", simply by selecting the Camera button, and following the directions on the "Scan Clue Card" dialog. 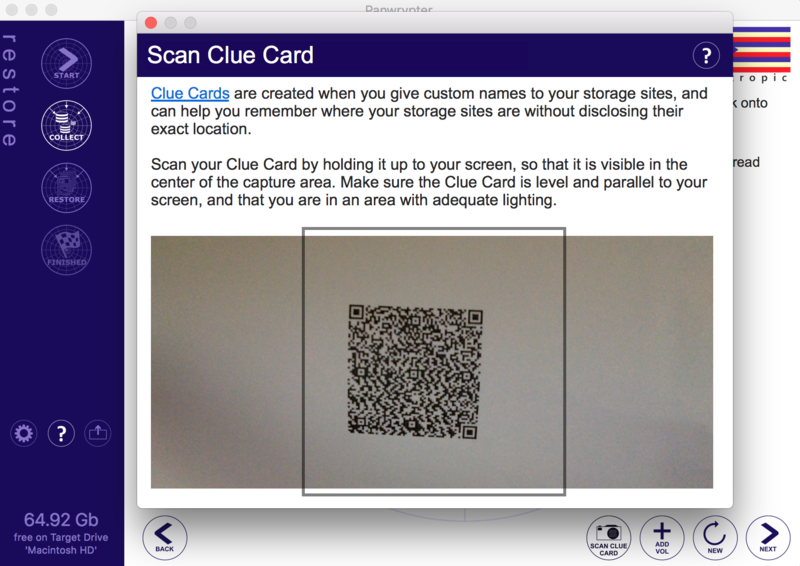 Once you have successfully scanned your Clue Card, the "Scan Clue Card" dialog will close, and the original session name and site clues will be displayed. You can then start collecting your protected volumes by selecting the (+) button and selecting each storage site in Finder. For more information, refer to Restoring Files.